Modern Villa spread over three floors having a sleek, modern design with a large living room and fantastic view to the ocean sea and providing an outdoor swimming pool. Set on the hilltop of the village of Praia da Areia Branca (White Sand Beach) “Casas da Arriba” (houses of the hilltop / Cliff houses) are located at the top of the village, within peaceful green surroundings and having a nice view over the village to the beach and a spectacular sunset. “Casas da Arriba” are at 7 minutes walking down to the “Praia de Areia Branca” beach (around 600m). “Casas da Arriba N5” Villa is spacious and feature modern décor. With Free Wi-Fi access and Free private parking/garage available. The main entrance is at the ground floor level with: (a) modern full equipped kitchen with dishwasher, oven, microwave and ceramic hob; (b) a spacious and comfortable dining and living room opened to the terrace and outdoor swimming pool with complete amenities; and (c) a toilette. Bedrooms are located at the 1st floor and are well-equipped: (a) suite bedroom (2,0 x 1,8 m bed) with a fantastic view over the village to the beach – you may wake up seeing the sea waves – surrounded by a chest of drawers and a sofa, the suite has a nice en-suite bathroom with shower and toilette for being used simultaneously by the couple; the suite has a dressing area with closets w/drawers and clothes hangers; (b) a second bedroom is equipped with a double size bed (2,0 x 1,6 m) a closet and a chest of drawers and a standalone clothes hanger; (c) the third bedroom is equipped with a double size bed (2,0 x 1,6 m) a closet a chest of drawers and a sofa; (d) both bedrooms (b and c) are served by a spacious bathroom with shower and toilette. Hairdryer available. .
At the basement there is an open space with a reading area and a small library an office table and a recreation area with a Snooker table. Two complete bathrooms with shower and toilette and a full equipped laundry (washing machine, dryer machine, iron table and iron etc…). Casas da Arriba N5 Villa has a double terrace equipped with garden furniture and sun loungers near the private outdoor swimming pool (5,5m long x 3,5m wide and 1,15m to 1,75 depth A BBQ grill with wheels is available. Guests are welcome to cook their own meals in the kitchen or even using the BBQ grill, enjoying the magnificent spaces within family. Guests should do your own shopping on local market or may go to Lourinhã, the closest city 3,5 km away by car where supermarkets are available (Lidl, InterMarché and Pingo Doce). Casas da Arriba are located at the hilltop of Praia da Areia Branca village, at the highest point, set away from the road and any noise. Ideal choice for those looking for peaceful holidays near the beach searching for the perfect surfing spot, or simply to relax and enjoy the private swimming pool and the beauty of nature.The area is surrounded by green agricultural farms, spectacular scarps near the sea and sand dunes. There are pedestrian cycling paths. Lourinhã - is 3,5 km away and has a variety of restaurant options for guests to choose from. At Lourinhã you can visit a Dinosaur-era Museum (More than 20,000 visitors flock to this museum yearly for its immense dinosaur fossil collection, as well as archaeology and ethnography exhibits.). Óbidos is 20 km away - a medieval town with a castle and many cultural activities, while Peniche is 15 km away. At Peniche visitors may see its Fortis - Marvel at far-reaching sea views from the fortified walls of this 16th century fort, erected to protect this fishing town from pirates. Peniche Fort was also known because of its linkage with the dictatorial ship – in force until the revolution that took place in April 1974 in Portugal. Peniche is also known for its connection with Surfing competitions. "Supertubos" surf beach is the most well-known for Surf experts. Portugal’s West Coast boasts (Peniche; Baleal etc..) a number of beaches with waves suited to surfers of all levels, as well as surfing competitions. From Peniche sea port there are boat connections to Berlengas Islands - nice to spend a full day seeing that natural protected area. Ericeira a renowned tourist destination (fresh fish as well as surfing destination) is 50 km away and the mystical Sintra village is a 60-minute drive. The nearest airport is the Humberto Delgado Airport in Lisbon set at 70 km. Praia da Areia Branca is located at around 80km from Lisbon. From Lisbon the best way is to take A8 highway toward north (Leiria); at A8 after Torres Vedras it is suggested take the exit toward Lourinhã; drive on the national road until Lourinhã; cross Lourinhã following the signs Peniche; after went out from Lourinhã at around 3km away out there is a sign indicating Praia da Areia Branca on the left side – follow that; then go straight and reach the beach area (Praia da Areia Branca beach); when arriving near the beach you may see a dark yellow building “Pousada da Juventude” - follow the road to the right, climbing (av dos Golfinhos); at the top there is a little roundabout; turn left stay on the uphill road for around 200m; after the last villa on the right side turn right and turn left immediately after (50m or less) – from there you may already see “Casas da Arriba” at the hilltop above a public green area with steps; go uphill on the road almost until the end and turn left and left again to reach Avenida 24 de Junho; "Casas da Arriba N5" is located at left side (number 5). Available on every room. Ceiling fan w/remote control also available. Inverter system - generates cooling (appropriate for warmer summer days) and may generate hot air if needed. Guests can use the amenities available at the Laundry. Operators manual available in various languages. The first floor is served by a south facing balcony. Include arm chairs. It was the perfect villa, well equipped, extremely clean with great views and loads of space. The owners made us very welcome. Our stay couldn't have been better. 5 Star+. Very quiet area, easy walk to restaurants and beaches and just a short drive to amenities. Would certainly recommend it and we would definitely like to go back. I wish to see you again in one of our houses very soon. The photographs don't really do the villa justice. It was spacious, light and airy as well as comfortable. It was very well equipped and everything functioned well. Carlos was very welcoming, and on hand if required. 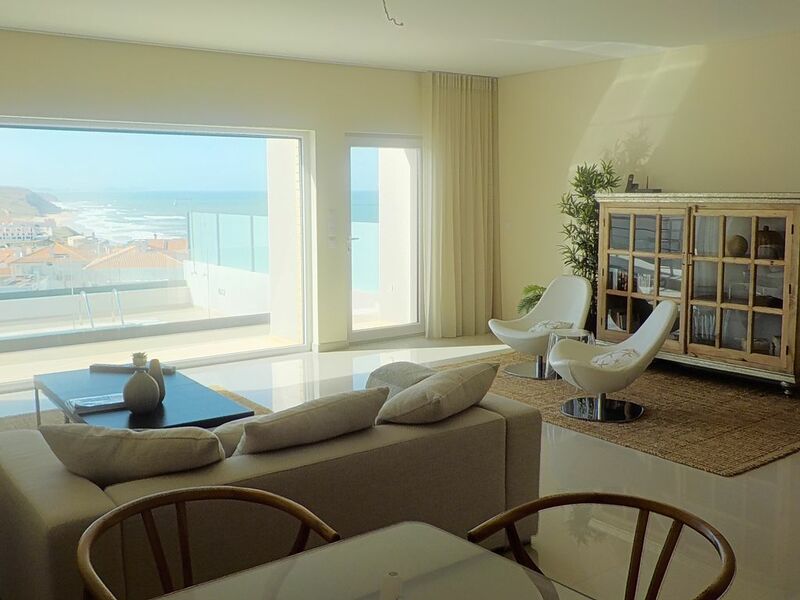 The villa is located on a hill 10 minutes walk from the main centre of Praia Da Areia Branca, and forms part of an area of development comprising high quality holiday homes and villas, which even in August felt very peaceful and quiet. Some of the plots in the local area were still under construction, but this did not impinge on our enjoyment of the property. Praia da Areia Branca itself has all the amenities, bars and restaurants that you would expect from a seaside location, generally of a high quality, and the village centre has a relaxed vibe which reflected the surfing schools which are locally based. Most of the general holiday makers and property owners appeared to be Portuguese and it felt like this helped to ensure the quality and value of the local restaurants, cafes and bakeries were better than you might find in more non-Portuguese dominated resorts. If you drink tea though, take your preferred English tea bags! We were a family of four with two older teenage boys and one girlfriend in tow, and all enjoyed the villa, and the freedom that it's close proximity to the local village provided. The teenagers managed a day out in Lisbon using the local bus service, as well as one to Peniche/Berlenga Islands. We also had a day out in Obidos, and managed a trip to the very local Go Kart track. Equally if you want to be lazy, the villa and swimming pool area is ideal for relaxing, and the local beach is both clean and supervised. The pool table in the basement area was also much appreciated. We would say a car was not absolutely essential, but recommended if you want a few days out, or like to have more food shopping options than the local mini-mart provides. Overall we had a great holiday and would highly recommend the property. Many thanks for such pleasant comments. This is a very beautiful house from top to bottom. It has absolutely everything you could wish for to a very high speck. We had a lovely time playing in the pool, enjoying the view,playing pool in the basement and using the house as a great base to explore the immediate village and surrounding area. We particularly enjoyed the Foz restaurant, Sintra and Obidos. Carlos is a great host and greeted us warmly and was supportive of us in any issues we raised during our stay. Fabulous villa and fantastic host. The pictures do not do the villa justice. We stayed in this fantastic villa for 2 weeks from 7th to 21st July 2017 for a family holiday. We can't recommend this villa enough and wouldn't hesitate to return. The villa is luxurious with everything you could possibly need or want, even down to cocktail making kit and pool table. It's more than home from home, in fact we wish we lived there! The pictures really don't do the villa or the view justice. It is beautiful and very peaceful at the villa, yet not far down to the beach or to the restaurants and bars. We strongly recommend the Indian restaurant "Maharani" and " Foz" which is right on the beach. We had very good meals in both. The town isn't crowded, which was lovely but there is still night life suitable for a family holiday. Everyone we met locally were very friendly. You will need a car to get about, but it is very easy to find your way around. There is the larger town of Lourinha about 3km away with several supermarkets and a market, as well as a small supermarket in Praia da Areia Branca. The villa is in a great position for sightseeing including visiting Lisbon (about 60km), Sintra (absolutely beautiful, allow a couple of days at least) and Cascais (we did an amazing Dolphin watching trip from here) to the south, as well as Obidos and Nazare (fantastic beach and great waves) to the north. Carlos, the owner, was great at communicating before we arrived checking any needs we had, staying in regular contact and providing lots of useful information. He was very welcoming on arrival, showing us around and explaining everything to us. He couldn't do enough to make sure we had a great stay. Nothing was too much trouble. We were welcomed with an amazing large bowl of fruit and Carlos & Tina came to say good bye and wish us a safe trip home with strawberries & Portugese champagne on our last day. They are a lovely, genuine couple who made us feel very welcome. If you are looking for a luxury villa in a great location with its own pool, amazing view, everything you could need for a fantastic holiday and great hosts, you won't be disappointed with this villa! We will be back. Sehr schönes Haus - empfehlenswert! Deutsches Fernsehen hat gefehlt, aber der Vermieter wollte dieses nachträglich organisieren. Zur Zeit waren leider einige Baustellen, aber dafür kann der Vermieter nichts. Der Pool ist leider nicht beheizt. Ansonsten war es ein sehr schönes Haus und der Vermieter bemühte sich, dass es uns gut geht. Rund um ein tolles Ferienvergnügen.